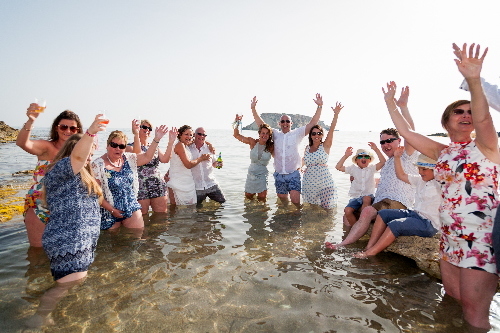 Over the years we have arranged hundreds of weddings in Cyprus, and we have a file full of thank you cards and email testimonials from many of our lovely couples. We always love hearing back from couples after the wedding as after all a wedding is a one off event and you don’t get to arrange another wedding for them! 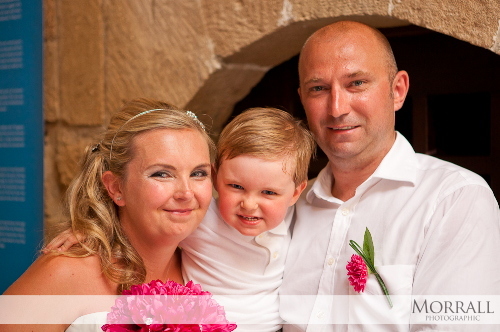 We do have couples that come back and visit Cyprus in the years following their wedding and it is always nice when they contact us or even pop in to see us. It is quite difficult to pick out which testimonials to share with you, but here are a few examples of the lovely comments we have received. Sue & Katie, Sorry we didn’t get a chance to hand this in person but I think poor Lee had a job on his hands going through all of our many photos. We just wanted to say a huge big thank you for everything you did for us on the day and the previous 2 years leading up to it. You two are an amazing team and put a lot of effort into everything you do and it really shows. My day went without a hitch and we hardly saw anything of you working tirelessly in the background. It will feel strange not receiving my weekly emails from ‘Sue’ but I will be back to pester you shortly for some lovely personalised gifts. I will be sure to recommend you on the crazy Facebook sits haha!. 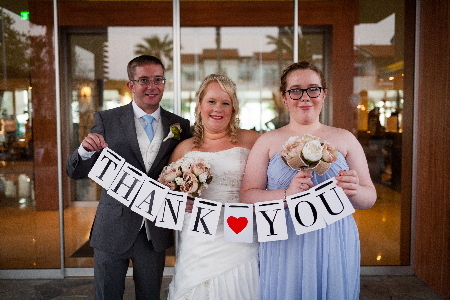 Hope you are well, now that everything has died down after our wedding holiday, wedding service and party here, we just wanted to drop you a line to express our thanks for everything you and Katie did and all your hard work in helping to make our wedding day in Paphos perfect! Everybody was amazed when we arrived at the Green Olive (given that we managed to keep the venue a secret from the 70 guests that were staying in the Kefalonitis next door) everyone was convinced when walking up that they were going to be getting on a coach somewhere. We definitely think we made the right decision in holding our wedding at the Green Olive instead of the beach having everything in the one venue meant it was a lot less stressful. Everyone commented on how beautiful the setup was for both the service and the meal, and the personalised fans went down well with everyone as did the bus tour. Thank you so much for making our wedding day so perfect. Please send our thanks and best wishes to Joanna, Lee and all the staff at Doria. Now we are back home and the washing basket has been cleared, I thought I would take a moment to say thank you to you and your daughter for managing our special day. The day went beautifully – too fast! but that is not in your control! Doria’s presentation and food was spot on – we called back to say a personal thank you when we picked up our certificate. Lee met up with us on our last day and handed the bulk of the photos across, he has sent photos of the trash the dress yesterday and we are thrilled. In fact we can’t fault anything and everyone showed such kindness to Dad helping him. I hope the cake topper reached you safely. I will be happy to recommend your company to anyone who mentions marrying abroad – well, actually did today – so who knows! You may have another customer. Myslef & Joe would like to thank you for the excellent job on planning our wedding day, the whole experience and day was perfect and reduced the stress of it all. The day went without any hitches, well apart from the registrar being late but there was nothing you could do about that! Gina & Joanna did a fabulous job of making us all look beautiful! Lee was absolutely lovely with the kids ad is very enthusiastic about his work, I know our family can’t wait to see the pictures. The only disappointment is that the salt and pepper pots that we were given by the registrar were broken coming home in Joe’s Dads bag! We will definitely be recommending you to other people. Just wanted to say a massive thank you, to you and Katie for everything you did for us to make our wedding go so smoothly. 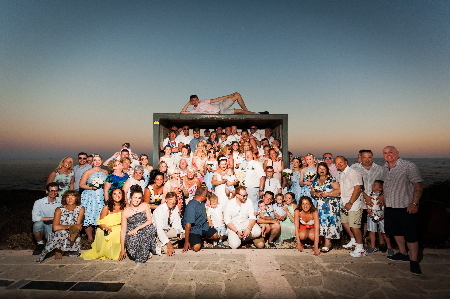 We had the most amazing day/evening and will certainly never forget any of it. We are now back in rainy England 🙁 sad it’s all over. Been looking at the photos Lee took, they are absolutely amazing! He truly captured and presented them in a story like way of our whole day events. We realised we failed to compliment the florist on our flowers. They were beatiful & excellent colour match for our colour scheme, they looked amazing in all of our photos, Please pass on out thanks and appreciation. Also all of our guests commented on how brilliant it was to have the fun bus to transport them, a fun and unqiue experience for everybody. we should also mention how well all of guests were catered for by yourself, Katie, Lee, Gina, Joanna, Marina, Yiannis & Panicos. A big thank you to everyone who contributed to making our day special, guys who set up the beach, registrar and anyone else we haven’t mentioned. In the excitement of the day we apologise as we failed to express our great appreciaton for all of the extra work and special touches that both you and Katie performed to make our day the best day of our lives. Just a quick message to say thank you to you and your fabulous team for a lovely day last Friday. Riad and I really enjoyed it once we got over the initial nerves. As you know we wanted something very low-key and initimate to celebrate our marriage and you provided exactly that. It couldn’t have been more perfect! Please let me know how I can place a recommendtaion on your website. You are definitely in tune with what people want: grand or simple. Thats a real talent! Lee said he would send the USBs in a package. Although Riad & I are rather shy, especially camera shy you were quite right ….. we quickly got used to it and relaxed. Now we are looking forward to seeing the results of Lee’s creative work. Bless him! What a lovely man. AND he saved my life! Again thank you so much for making our wedding day so perfect!